Yamitsu Hi Flow 50 air pump. The Yamitsu Hi Flow 50 air pump is capable of providing sufficient pressure at an output of 50 litres per minute at a depth of 4 feet. 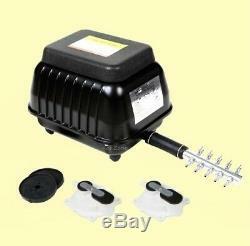 This makes the Yamitsu Hi Flow Airpumpit suitable for ponds and large aquariums & only 40 watts output. The Hi-Flow 50 air pumps are supplied complete with two spare diaphragms, two inlet valve assemblies and a high quality chrome manifold with ten individual taps. We are dedicated to ensuring the highest possible quality service to our customers, always going above and beyond! Any Damaged packages when item arrives, must checked to see if goods are ok & signed for as damaged. All Area's Below May Incur A Surcharge On Heavier items please check. AB31-AB38, AB40-AB56, IV1-IV28, IV-30-IV32, IV36, IV40, IV52-IV54, IV63, KW1-KW14, PA21-PA38, PH4-PH41, PH49-PH50, All BT postcodes (Northern Ireland). The purchaser ensures that the goods are securely and adequately packed to avoid damage. Order Cancellation or Changes to Orders. Once an order has been placed it will be processed almost immediately. This means if you wish to cancel the order you will need to send the goods back to us once received at your expense. Koi Zone's shop is based in Romford, Essex we stock a full range of Pond Products, Aquatics & Koi. We are open to the public on a daily basis. We Specialise in Koi Sales and all your Pond, Aquarium, Tropical & Marine related Products at very Competitive prices. We know how important it is for you to get what you ordered and get it fast. Our products are a 100% authentic and brand new. We work with some of the biggest suppliers of high quality pond products to bring you only the best items. We consider it a top priority that our customers are happy and in the rare event that they are not, we do our best to fix the situation. We normally provide you only the best experience when shopping with us! We also have an Outlet Store where you can come view koi for sale and lots of other pond related items and from which you can collect your items from if you prefer not to have them delivered by prior arrangement. We always try to accommodate customers needs and requirements where possible. We pride ourselves on delivering a service that will make you want to use us again and again. We use the top courier for koi deliveries and as of yet never had any casualties. Koi Zone have a full pet shop licence for our premises. All our products are covered by their manufacturers guarantee and are as described in the listings. The item "Yamitsu Hi-Flow 50 Air Pump Pond Airpumps" is in sale since Sunday, November 26, 2017. This item is in the category "Pet Supplies\Fish & Aquarium\Air Pumps". The seller is "koi-zone-pond-aquatics" and is located in Romford. This item can be shipped to United Kingdom.